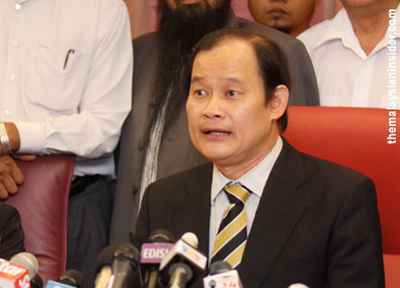 Perak DAP state chairman and Sitiawan state assemblyman (ADUN) Ngeh Koo Ham has queried the Perak BN state government on its alleged rampant approval of state land since the illegal coup in February 2009. “Dato’ Seri Dr Zambry Abd Kadir must come clean with regard to the clearing of 74 hectare of land at Sungai Mendelum area in the Royal Belum and the Temengor Forest Reserve and the 68,503 acres of land which he has approved since 2009,” he asked. “Internal sources have informed me that Dato’ Seri Zambry has approved a total of 68,503 acres of land since February 2009 till July this year! 60,561.75 acres of which are industrial or agricultural land which was approved at the rate RM375 per acre! Obviously the cronies who received such lands will reap huge profits,” he continued. This article was written by admin on Sunday, October 9, 2011 at 4:07 pm. You can follow any responses to this entry through the RSS feed. Both comments and pings are currently closed.